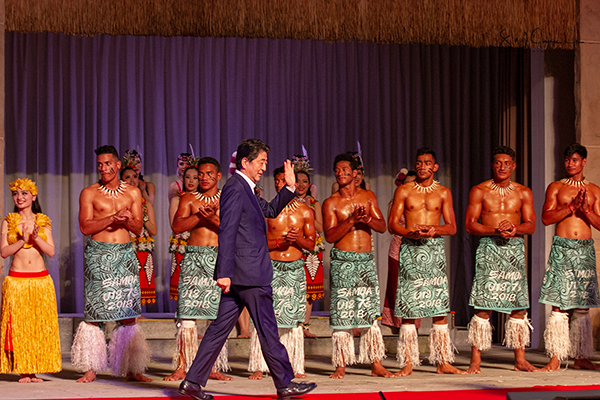 Iwaki, Fukushima—Prime Minister Shinzo Abe pulled no punches during his opening speech at the PALM 8 (Pacific Island Leaders Meeting) in Iwaki, Fukushima, Japan. He referenced the new concept of the “Blue Continent” established by members of the Pacific Islands Forum during the meeting in Samoa. “It means the ‘Pacific Ocean’. It is an expression, isn’t it, brimming with great respect for the vast blue ocean. Let us all champion ‘saving the blue’ more, embracing the same passion by which we urge people to ‘save the green’. That is because the ocean is crying out in despair,” he said. He went on to describe some of the travesties that are currently occurring in the Pacific Ocean. “PCBs are being detected in high concentrations in creatures dwelling at a depth of 10,000 meters below the ocean surface. The medium for this? Some say that’s microplastics. “Plankton and shellfish have decreased in number, because seawater has gotten less alkaline, and that’s because humankind has had the oceans absorb an inordinate amount of carbon dioxide. “And, in a mere 40 years, marine resources subjected to illegal and reckless overfishing have also increased to three times the previous level. This is taking place not only in the high seas but also with your own EEZs, with lawless foreign fishing vessels continuing their indiscriminate activities. “Then there is the issue of deep sea bed resources. Even though the development of such resources might well damage marine ecosystems in an irreversible way, we have yet to have a governance system that needs to be put in place. He challenged the leaders to consider the PALM process a venue for finding solutions to the problems the countries jointly share. “In order to prevent the degradation of our seas and the trampling of the rule of law, shall we not take a step forward towards action,” he asked. 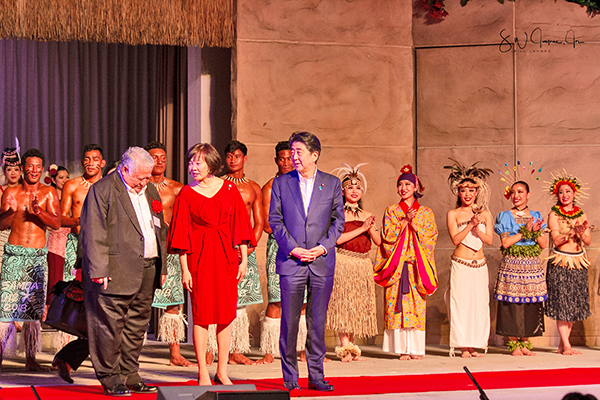 He reminded the gathered leaders that the pledges that Japan had made to the Pacific Island Countries during the PALM 7, three years previous had all been met including ground breaking on the Pacific Climate Change Center on the campus of SPREP headquarters in Samoa. That center will be a resource to Pacific Islands to access funding under International agreements for Climate Change and for access to data on Climate Change. “Resolute in our determination that safeguarding the sea and safeguarding the planet and human kind are one and the same, my country will continue to make efforts with you all,” he said. “Where Japan wishes to place emphasis from now is, first of all, in establishing the rule of law in maritime order…Japan will be unstinting in its assistance towards improving countries’ capacity to ‘protect the sea’, including each country’s legal enforcement capabilities,” he committed. “Second, Japan will work to develop quality infrastructure in both ‘hard’ and ‘soft’ aspects so that you are able to realize the sustainable prosperity in a self-reliant manner. 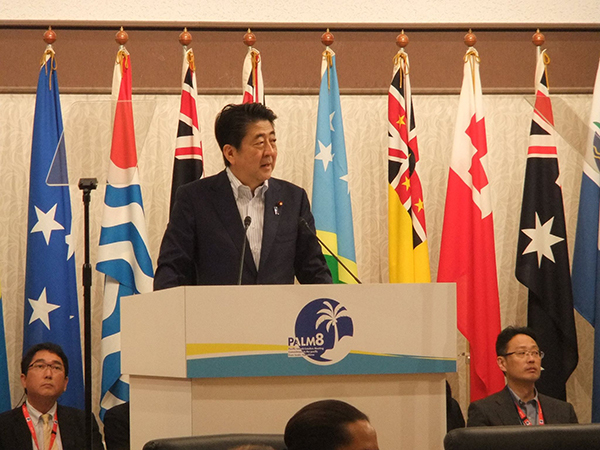 Of particular importance to Japan during the PALM 8 was the “Indo-Pacific Strategy” and Prime Minister Abe spent the last moments of his speech discussing it and trying to garner support for the concept. “My friends,” he said, “it is nothing more than an artificial, expedient custom to distinguish between one stretch of water we call the Pacific Ocean and another we deem the Indian Ocean. The two are one and the same, as a matter of course. “It was the ancestors of the PALM peoples that in the long-distant past brought about the ‘confluence of the two seas’ through trade,” he said and gave an anecdote about Pacific island products finding their way to the east coast of Africa. “The ‘Blue Pacific’ where we make our home is one and the same as the ‘Blue Indian Ocean’. Opportunities and possibilities coexist in these two seas, and the questions to be worked out and the growing crises stretch across both oceans, unable to be separated. “On this occasion, shall we not—each and every one of us—take on an expansive oceanic identity by which we view the two oceans holistically? “That will expand our field of the vision geographically. It will impart to us a viewpoint by which we look at the system of the vast seas with a very long term perspective,” he said. He concluded his speech by equating the PALM process to a long-distance relay race with each runner passing the baton to another as they run. He expressed his thanks to the tireless efforts of the runners who had come before.